Free to Enter – no purchase necessary! 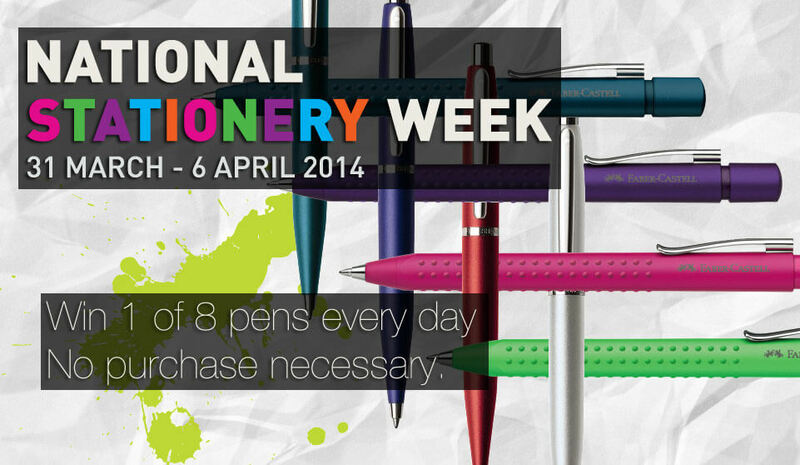 We have 4 Faber-Castell Grip 2011 ball pens and 4 Sheaffer VFM ballpoint pens to give away every day of National Stationery week. To enter simply follow the links below to each day’s draw and complete the simple steps to enter. Each day is open for entry immediately (you can enter all at the same time – no need to come back every day!) and will close at midnight each day. The winners will be announced here the following morning. Each day we will giveaway four Faber-Castell Grip pens, one, purple, one pink, one lime and one petrol, and, 4 Sheaffer VFM pens – one in each of the following colours; Strobe Silver, Excessive Red, Neon Blue and Ultra Mint to eight luck winners. Entry is open to everyone not just UK residence. The winners will be chosen at random and the prizes will also be assigned at random. The decision of The Pen Company is final and no correspondence will be entered into. There is no cash equivalent prize offered. By entering the competition you are bound by these rules. Enter Day 1 draw – Closed; winners listed below. Enter Day 2 draw – Closed; winners listed below. Enter Day 3 draw – Closed; winners listed below. Enter Day 4 draw – Closed; winners listed below. Enter Day 5 draw – Closed; winners listed below. Enter Day 6 draw – Closed; winners listed below. Enter Day 7 draw – Closed; winners listed below. All winners will be emailed shortly to arrange delivery of their prize. Win a 2016 Paperblanks Diary of YOUR Choice!